In late April 2012, the Argentine government shocked oil markets by re-nationalizing the YPF oil company. President Cristina Fernandez (who succeeded her late husband Néstor Kirchner) belongs to the Peronist movement, which in turn has long dominated the politics of Argentina. The shares of the Spanish private firm Repsol were drastically reduced from 57% to 6%. The expropriation enjoys broad popular and political support, beyond the Peronist government. Founded in 1922 as a state-run company charged with developing the country’s oil deposits, YPF quickly became one of Argentina’s largest, and most iconic, firms. Under pressure from the IMF to increase privatization, it was sold to Repsol in 1992. Later a new Argentine shareholder, the Esquenazi family, with relations to Nestor Kirchner, took a 25% share of YPF. The recent partial expropriation will bring the state (and province) share to 51% of YPF ownership. Repsol said it will fight expropriation in the courts. It is asking for about 10 billion dollars as an appropriate price to be paid for by Argentina. It is likely to get much less, depending in part on the money valuation of the environmental liabilities. 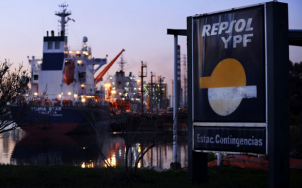 The President and her ministers accuse Repsol YPF of repatriating profits to Spain instead of investing enough in Argentina to reverse years of declining output that have turned the country into a net energy importer for the first time in nearly two decades. Now, the government and some members of the Senate are also bringing forward a new and somewhat contradictory argument. Repsol YPFs dwindling activity has nevertheless left large environmental liabilities behind. The best part of this whole affair is that the words “Pasivo Ambiental” (environmental liability) have become front-page news in Buenos Aires – and beyond. The expropriation of YPF is making the issue of environmental liabilities very topical not only in Argentina but in general in Latin America. This is similar to the Chevron Texaco court decisions in 2011 and 2012 in Ecuador, though in Argentina civil society has had a much smaller role in claiming environmental liabilities than in Ecuador. The government of Argentina has now gleefully noticed that environmental liabilities can be subtracted from the payment to Repsol’s shareholders. Indeed they can and they should be subtracted. However, in the long run, the insistence on the universal painful truth that the extractive industries leave behind large environmental liabilities (whether it is Repsol or PDVSA, whether Agip or Petrobras) may become double edged. It can also be applied to the national or foreign mining companies (like Xstratra in La Alumbrera) in Argentina, which the current government is promoting and supporting. They are also leaving large environmental liabilities behind, unaccounted for. And the same applies to the very large soybean export industry because of deforestation and damage to human health from glyphosate. Argentina’s National Appraisal Court will determine what compensation the expropriated shareholders of Repsol YPF will receive. Government ministers have hinted that the Spanish firm might not receive anything at all if YPF’s environmental liabilities are taken into account. Such environmental liabilities (in Loma de la Lata and elsewhere) have been in the news from time to time over the last 15 years, even before Repsol bought YPF in 1992. Claims have come from indigenous groups and from the governments of some provinces (Neuquen, Santa Cruz, Mendoza), through the courts, through politics, through activists’ movements, without much success until now. This is likely to change, with a central government trying to prove as much environmental liabilities as possible. Also in Spain itself, there has long been a campaign with the title “Repsol Mata” (Repsol kills) based in shareholder activism and other forms of public protest to enhance awareness of what Repsol was doing not only in Argentina but also in Bolivia, Ecuador and elsewhere. While criticized by many, the move from Cristina Fernandez to claim environmental liabilities might not just bring justice to many people in Argentina who suffered from Repsol’s activities, it might make other oil and mining operators throughout the continent and the globe realize that their environmental liabilities will haunt them until they manage to deal with them.